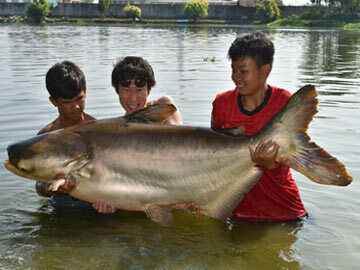 Home Catch Reports Palm Tree Lagoon Mekong Catfish fishing. Japanese angler Narusima spends a day fishing at Palm Tree Lagoon for Mekong Catfish. Narusima a visiting Japanese angler decided on a trip to Palm Tree Lagoon at the start of his fishing holiday in Thailand. On arrival at the lake, the angler was soon casting out towards the hordes of showing fish in the centre of the lake. Fishing two rods with floating bungs set at 2m depth the angler waitied patiently for action. After rebaiting both rods and recasting it wasnt long before one of the floats dipped under the surface and line began to be stripped from the reel. Winding down into the fish saw the rod arched over into full fighting curve as it took the full weight of a large Mekong Catfish. A fifiteen minute battlefollowed which saw the fish making several circuits of the lake before it was finally landed. On netting the fish and bringing it onto the bank a large Mekong Catfish was revealed to the angler which was estimated to weigh 45 kg. The Mekong Catfish was released after a few trophy shots. Further casts produced more Striped Catfish and Mekong Catfish in the 20-25kg range as the afternoon’s fishing progressed. After stopping for a leisurely lunch, fishing began once again. The predator rods still amazingly not having receieved a pick up yet! With the weather unseasonably cold for the time of year fishing remained slow by Palm Tree standards and Narusima only landed a few more small Catfish during the remainder of the days fishing. Lure fishing in Thailand-Pilot ponds 2017Fishing at New Bungsamran Lake near Bangkok.